The dancers of No Bueno were Bass, Marty Buhler, and Natalie Border. All are fantastic performers to watch, and they executed the work with richness and ease. During the short performance, each took a solo, Bass and Buhler performed a duet, and the three came together in pieces that served as bookends for the rest. The group began with walking patterns back and forth, contracting in and out. They shifted mostly in unison to a bouncy and driving groove, sliding into deep grand pliés in second, sometimes stopping to reach an arm out to the side, elbow cocked. When Bass and Buhler exited, Border grabbed a folding chair and slunk to it, center stage. Hotly shaking off its gravity to do a jerky, windmill-armed, off-balance tiptoe before retreating back into its support, her anxious solo was the most explicitly emotive segment of the show. When Bass and Buhler reappeared they were side by side. Here as in the group sections, they moved together without eye contact. Their far-off stares went out above our heads, while the closeness of bodies and movements in unison established connection. Simple shuffling steps combined with sudden held extensions, and with repeated gestures that were shared and passed back and forth. Buhler’s solo was next, characterized by more wide, slow grand pliés with the head rolled back and clasped hands stretched out long — matching plaintive vocals and a slower, heavier beat. Bass turned his back to the audience for much of his solo, reprising those pliés again, this time a little sharper and paired with elastic undulations of the torso and fluttering fingers. As all three dancers reappeared, the music turned to soft piano and the choreography drew a line through everything that had come before, restating themes from each movement. A final tableau transformed the dancers into a small flock of birds – perched in deep, forward lunges, wings back, fingertips fluttering, heads swiveling, before they walked upstage away from us as the music flared again and cut to black. Surrounding the simplicity of each dance were elements unfolding texture, depth, and tone. The music was Bass’s own composition, born of a self-proclaimed deep love for amateur tinkering in GarageBand. It was mostly in the realm of electronic dance club music, beat-heavy but also pop-y, dipping between a pulsing groove and something more moody and sweeping. The costumes were likewise home-hewn, beautifully busy fabric of jumbled blue squares turned into knee-length skirts paired with plain black tees. After the performance, Bass explained that there was no specific intention behind the costuming, just an easy sewing pattern and the chance to practice another favorite hobby. And then there were the vocal audio recordings woven into Bass’s solo and the final section: the first was a spoken word poem, “The Revolution Will Not Be Digitized” (a modern take on Gil Scott Heron’s iconic 1970 recording), from a YouTube video posted by poet Danny Mahes in 2011; and the other a 2015 viral video wherein high-schooler Shea Glover walks around campus telling people she wants to photograph them because she is “taking pictures of things I find beautiful.” Bass re-cut and looped the latter, placing it over a tinkling piano. In the Q&A, he expounded rhapsodically about his love of ambitious gesture, how he first found that video, and how he sort of included it on a whim just because he found it so delightfully affective and sweet. 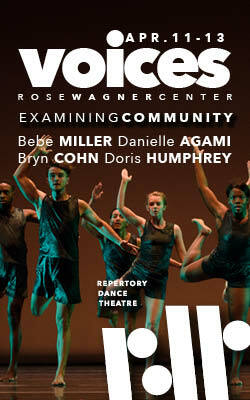 Speaking more about the choreography, Bass touched on the specific and personal nature of his work. He explained how he created movement and method to be uncomplicated and purposely “lowbrow,” choosing to reflect the dancers, the process, and the vast minutiae of day-to-day experiences over labored sophistication and grander ideas. Referring to the process of creating No Bueno, Bass described it as a sort of experiment — if awarded an opportunity by Sugar Space to do a show, what could he come up with given the limited time and resources he had available? Might as well try it. The assorted elements of No Bueno shared an appreciable thread of purposefully D.I.Y. and resourceful creativity similar to previous works by Bass. Discovered elements and those at hand were dissected and reassembled and inserted alongside movement phrases of irrelative origin without precise bearing in mind. The work took shape as it was created, and the different pieces ultimately came together to form a sort of tapestry, reflective of Bass himself in that moment in time and of the people he worked with — likes and dislikes, relationships, media consumed, activities enjoyed, social climate. This meandering approach through personal hobbies and cultural touchstones bestowed a nice, nuanced layering on the sensibility of the final product, which was never overly heavy on conceptual detail or framework to begin with. If No Bueno was a sort of casual and sprawling experiment it was also passionate, crafted, and intuitively well-defined self-expression. 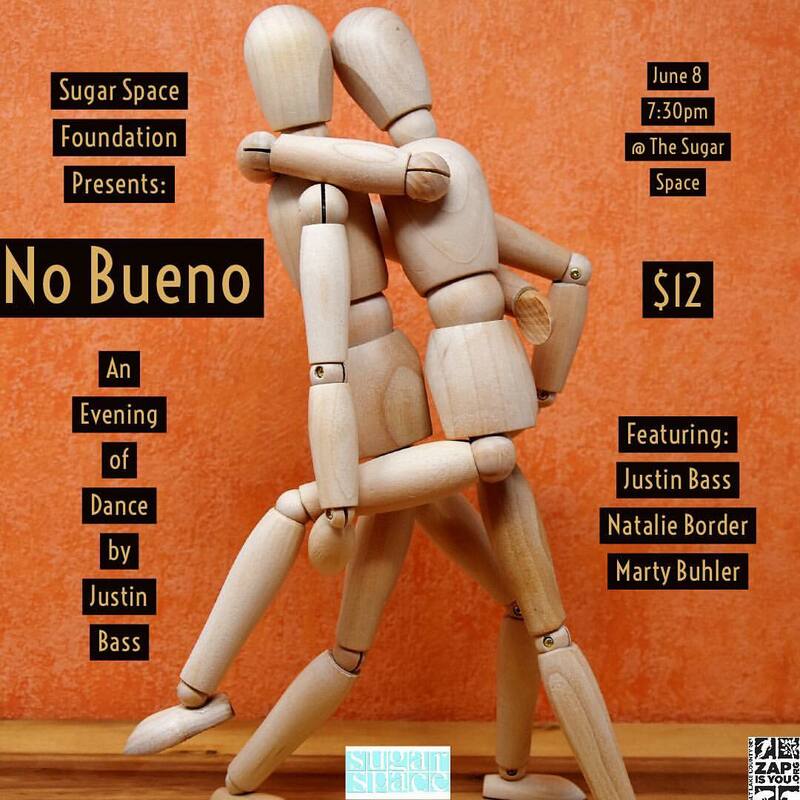 No Bueno, by Justin Bass, was performed at Sugar Space June 8.